perfect for quickly and simply making all sill areas weatherproof, preventing water penetration during and after construction. an incredibly elastic butyl rubber sheet which forms a weather tight seal on the sill of all new window installations. ideal for forming a DPC around window and door reveals and for sealing parapet walls prior to application of the capping. suitable for use on all types of masonry and timber framed buildings. suitable for winter application down to 0°C. Ampacoll Sillskin is used externally on the sill area of the building, prior to, or after, installation of the window or door frame. Can also be used around the sides and head of the window as a damp proof layer. Surfaces should be clean, dry and free of dust before the sheet is applied. Porous, dirty or friable surfaces, such as masonry or wood fibre boards, must be primed with Ampacoll Primax Primer prior to application. Ampacoll Sillskin bonds instantly to the surface so it is important to apply carefully. Choose the correct width of sheet for the sill. The sheet should be wide enough to cover either the entire sill area plus 50mm that can drop down the front face of the wall. Or, with 20mm bonded to the front of the window frame, from the front of the window to the front face of the wall plus 50mm to drop down the front of the wall. Cut the sheet to the required length which would be the width of the sill area plus at least a 100mm upstand at either end. Remove the backing paper and hang the sheet in a U-shape within the reveal with the bottom of the U in the centre of the sill area. Ensure there is enough overhang over the front edge to create the 50mm drop down. Slowly lower the sheet on to the sill allowing the sheet to make contact, starting in the middle and working towards the corners. As you reach the corners, firmly press the tape to ensure it reaches right into the corner of the reveal, then apply up the sides of the reveal. Once this has been firmly pressed in to place, press the tape around on to the front of the wall and allow it to stretch around the corners. Each roll of Ampacoll Sillskin self adhesive window sill DPC is 20m long and either 150, 200 or 300mm wide. 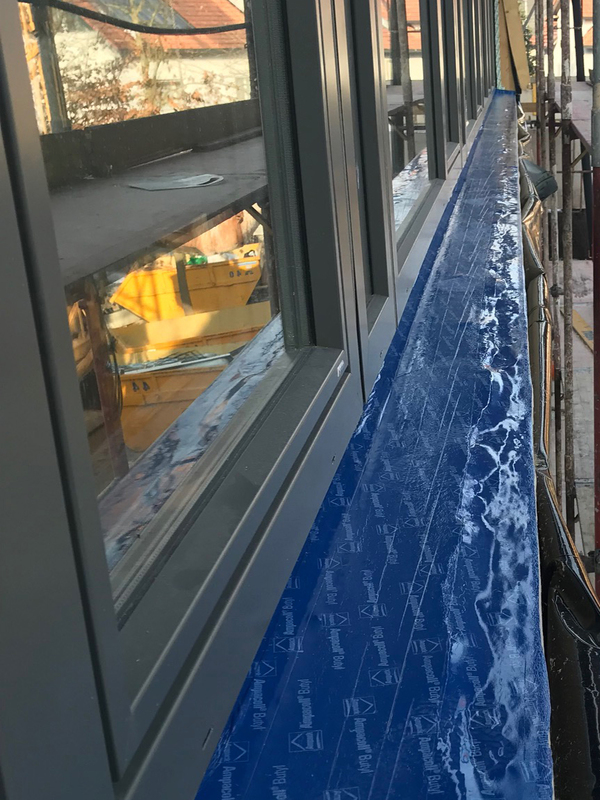 Here you can see the Ampacoll SillSkin bonded to the sill of the window opening, ensuring there is no moisture ingress whilst construction continues without the window sills. This makes it ideal for timber frame construction which always suffers in these areas during construction. Because of the butyl rubber used in the SillSkin product, even when the sill is installed it will seal around any screw or nail penetrations. Ampacoll Sillskin tape is priced as below. Prices do not include VAT or carriage.